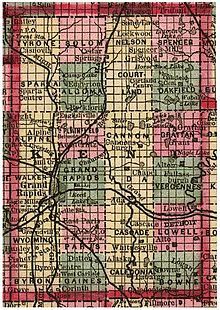 Kent County is a county in the U.S. state of Michigan. As of the 2010 census, the county had a population of 602,622. Its county seat is Grand Rapids. The county was set off in 1831, and organized in 1836. It is named for New York jurist and legal scholar James Kent, who represented the Michigan Territory in its dispute with Ohio over the Toledo Strip. Kent County is part of the Grand Rapids–Wyoming, MI Metropolitan Statistical Area. Kent County is West Michigan's economic and manufacturing center, with the Steelcase corporation based in the county. It is also the home of the Frederik Meijer Gardens, a significant cultural landmark of the Midwest. The county is a traditional stronghold for the Republican Party, with a substantial conservative population, but in 2008, Barack Obama became the first Democratic presidential candidate to carry the county since 1964. The Gerald R. Ford International Airport is within the county. The Grand River runs through the county. On its west bank are burial mounds, remnants of the Hopewell Indians who lived there. The river valley was an important center for the fur trade in the early 19th century. After the War of 1812, Rix Robinson and Louis Campau were the earliest traders in the area. In 1826, Campau established a trading post in what is today Grand Rapids. In 1831, he bought land and platted the town. Campau considered the town's "father". One year later, government surveyor Lucius Lyon purchased land north of Campau's property. Campau surveyed and platted the village following Native American trails and Lyon had platted his property in an English grid format, which meant there were two adjoining villages, with different platting formats. Campau later merged the villages under the name of Grand Rapids. In 1831, it was set off from Kalamazoo County. 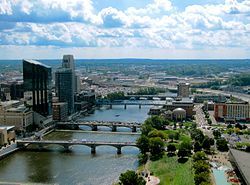 In 1838, Grand Rapids was incorporated as the county's first village. By the end of the century, stimulated by the construction of several sawmills, the area was a significant center for agriculture, logging, and manufacturing furniture. According to the U.S. Census Bureau, the county has an area of 872 square miles (2,260 km2), of which 847 square miles (2,190 km2) is land and 25 square miles (65 km2) (2.9%) is water. Kent County's highest point is Fisk Knob Park, in Solon Township, at 1048 feet. Flat River, enters the county from the east, and joins the Grand from the north, in Lowell. Thornapple River, enters the county from the south, and joins the Grand in Ada. Rogue River, enters the county from the north, and joins the Grand in Belmont. North Country Trail, runs north/south the length of the county, passing through Cedar Springs, Grattan and Lowell. Lowell is the trail's half-way point, and the national headquarters of the North Country Trail Association is located here. Thornapple Trail, begins in Kentwood and runs southeast through Dutton and Caledonia. White Pine Trail begins in Comstock Park and runs northeast through Belmont, Rockford, Cedar Springs, and Sand Lake. Kent Trails (which is singular in spite of the 's') runs north/south from John Ball Park in Grand Rapids to 84th Street in Byron Township, with an extension that runs east/west along 76th Street and north/south from 76th Street to Douglas Walker Park on 84th street. The Frederik Meijer Trail, which, as of November, 2008, was incomplete, runs east/west mostly along the M-6 freeway and will connect the Kent Trails and the Thornapple Trail when completed. Cannon Township Trail runs through Cannon Township in the eastern part of the county from Cannon Township Center on M-44. It runs along M-44 then south near Sunfish Lake Road, turning east through the Cannonsburg Cemetery, and ends at Warren Townsend Park near Cannonsburg. As of the 2010 United States Census, there were 602,622 people residing in the county. 76.1% were non-Hispanic White, 10.2% Black or African American, 2.4% Asian, 0.7% Native American, 4.5% of some other race and 2.6% of two or more races. 9.7% were Hispanic or Latino (of any race). As of the census of 2000, there were 574,335 people, 212,890 households, and 144,126 families residing in the county. The current estimated population is 604,323. The population density was 671 people per square mile (259/km²). There were 224,000 housing units at an average density of 262 per square mile (101/km²). The racial makeup of the county was 83.13% White, 8.93% Black or African American, 0.52% Native American, 1.86% Asian, 0.06% Pacific Islander, 3.34% from other races, and 2.16% from two or more races. 7.00% of the population were Hispanic or Latino of any race. 19.6% reported being of Dutch ancestry; 14.9% German, 13.1% English, 7.4% Irish, 7.1% Polish and 5.5% American ancestry according to the 2010 American Community Survey. 90.0% spoke only English at home, while 6.0% spoke Spanish. There were 212,890 households out of which 35.80% had children under the age of 18 living with them, 52.30% were married couples living together, 11.60% had a female householder with no husband present, and 32.30% were non-families. 25.60% of all households were made up of individuals and 8.00% had someone living alone who was 65 years of age or older. The average household size was 2.64 and the average family size was 3.20. The age distribution of the county was as follows:28.30% were under the age of 18, 10.50% from 18 to 24, 31.20% from 25 to 44, 19.70% from 45 to 64, and 10.40% who were 65 years of age or older. The median age was 32 years. For every 100 females, there were 96.90 males. For every 100 females age 18 and over, there were 93.70 males. The median income for a household in the county was $45,980, and the median income for a family was $54,770. Males had a median income of $39,878 versus $27,364 for females. The per capita income for the county was $21,629. 8.90% of the population and 6.30% of families were below the poverty line. 10.20% of the population under the age of 18 and 7.50% of those 65 or older were living in poverty. Commercial air service to Grand Rapids is provided by Gerald R. Ford International Airport (GRR). Previously named Kent County International Airport, it holds Grand Rapids' mark in modern history with the United States' first regularly scheduled airline service, beginning July 31, 1926, between Grand Rapids and Detroit. Public bus transportation is provided by the Interurban Transit Partnership, which brands itself as "The Rapid." Transportation is also provided by the DASH buses: the "Downtown Area Shuttle." These provide transportation to and from the parking lots in the city of Grand Rapids to various designated loading and unloading spots around the city. Amtrak provides direct train service to Chicago from the passenger station via the Pere Marquette line. Freight service is provided by CN, CSX Transportation, and by a local short-line railroad, the Grand Rapids Eastern Railroad. The county government operates the jail, maintains rural roads, operates the major local courts, keeps files of deeds and mortgages, maintains vital records, administers public health regulations, and participates with the state in the provision of welfare and other social services. The county board of commissioners controls the budget but has only limited authority to make laws or ordinances. In Michigan, most local government functions—police and fire, building and zoning, tax assessment, street maintenance, etc.—are the responsibility of individual cities and townships. County Commission or Board of Commissioners: 19 members, elected from districts (11 Republicans, 8 Democrats), Mandy Bolter (Republican) serves as board chair. Kent County has historically been a stronghold of the Republican Party, and usually supports its candidates for local and federal office. It has, however, become more politically competitive in recent years. Most Democratic strength is concentrated in Grand Rapids itself, which usually sends Democrats to the state house and occasionally elects Democratic mayors. The suburbs, however, are some of the most Republican areas in Michigan. In 2008, Democratic presidential candidate Barack Obama narrowly carried the county, receiving 49.34% of its votes to Republican John McCain's 48.83%. It was the first time the county had supported a Democrat for president since 1964, and only the fourth time since 1884. By comparison, George W. Bush had taken almost 59 percent of the county's vote in 2004. In 2012, the county returned to the Republican camp as Mitt Romney won 53.0% of the vote to Obama's 45.35 %. Four years later, Republican Donald Trump won the county with 47.66% of the vote, to 44.61% for his Democratic rival, Hillary Clinton, while Gary Johnson of the Libertarian Party received 4.58%. ^ a b "Bibliography on Kent County". Clarke Historical Library, Central Michigan University. Retrieved January 19, 2013. ^ a b "State & County QuickFacts". United States Census Bureau. Archived from the original on July 13, 2011. Retrieved August 28, 2013. ^ Beld, Gordon G. (2012). Grand Times in Grand Rapids: Pieces of Furniture City History, pp. 17-19. The History Press. ^ Fuller, George Newman (1916). Economic and Social Beginnings of Michigan, p. 423. Wynkoop Hallenbeck Crawford Co.
^ History and Directory of Kent County, Michigan, Containing a History of Each Township, and the City of Grand Rapids; the Name, Location and Postoffice Address of All Residents Outside of the City: A List of Postoffices in the County; a Schedule of Population; and Other Valuable Statistics. Grand Rapids, MI: Daily Eagle Steam Printing House. November 21, 1870. pp. 114–136. ^ a b c d e Garret Ellison (May 22, 2014). "How a feud between the city's founding fathers shaped Monroe Center and downtown Grand Rapids". MLive Media Group. ^ Garret Ellison (August 11, 2013). "History in bronze: Influential figures immortalized at 12 sites so far in Grand Rapids". MLive Media Group. ^ Purkey, Thomas H. (1986). Soil Survey of Kent County, Michigan, p. 2. United States Department of Agriculture, Soil Conservation Service. ^ "2010 Data Release – Data & Documentation – American Community Survey – U.S. Census Bureau". Archived from the original on 2015-10-27. ^ "Kent County Commissioners elect Mandy Bolter as new board chair". mlive.com. Retrieved 2019-01-03. ^ Leip, David. "Dave Leip's Atlas of U.S. Presidential Elections". uselectionatlas.org. Retrieved 2 April 2018. ^ "Dave Leip's Atlas of U.S. Presidential Elections - State Data". Wikimedia Commons has media related to Kent County, Michigan. "Bibliography on Kent County". Clarke Historical Library, Central Michigan University. Retrieved January 19, 2013.